The Goal with RA Is Not Perfection: Don’t Give Up the Things You Love! As I’ve said, I get wonderful notes every day. It’s definitely one of my favorite parts of this blog. Recently, I shared with you some comments that were especially encouraging for all of us. Today, I’d like to share an email. 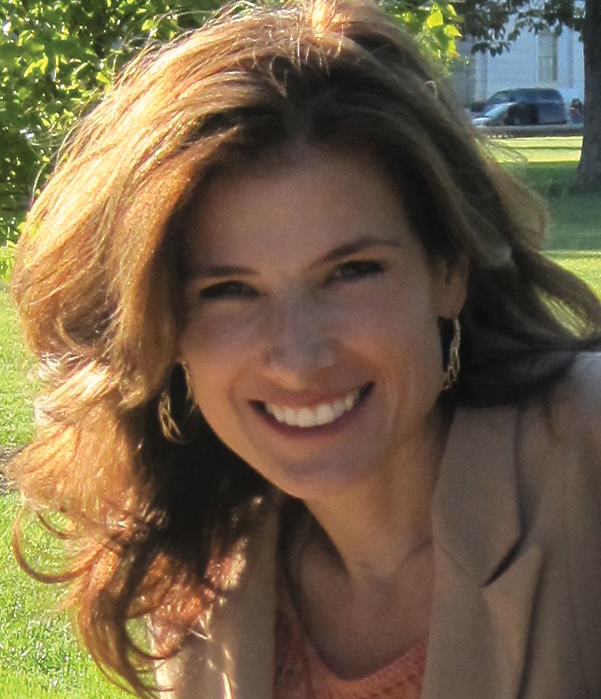 Carolyn wrote to share how she has adapted to be able to continue her beloved work: sewing. I asked her to add a little more and soon we had a guest blog! Thank you, Carolyn. Sewing isn’t essential to most RA warriors, but for me it is part of who I am. All my life I’ve sewn. Sewing has been more than a hobby… it’s part of who I am. As my fingers froze and refused to move, I almost gave up and depression became a constant fight. My mother had RA and stopped sewing entirely. She even refused to talk about it. When the only joint on my fingers that would move was the one near my nails, I thought my sewing days were over. I decided to at least teach what I knew to anyone who wanted to learn. However, in teaching, I couldn’t stay away from the machine. I discovered I could straight stitch my Bernina machine for limited periods of time. Here are a few of the things that help me. Slowly, I experimented with the tools I already had. One rotary cutter (like a pizza cutter) worked, but another didn’t. I also found out new sharp blades made a big difference. I started cutting just straight pieces of fabric and making small quilts. It might take two weeks to cut the pieces, but eventually it got done. Again it is slow, but I could do it. In January, our first great grandbaby is due. I’m trying to make a baby bunting at the moment. It is hard, but slowly piece by piece it is coming together. Maybe my daughter will finish the handsewing. It is such a joy for me to find ways to continue what I love doing. I decided to find more simple solutions since I had a lot more equipment than the average seamstress has. Threading a needle is a real challenge when you have trouble holding the thread. 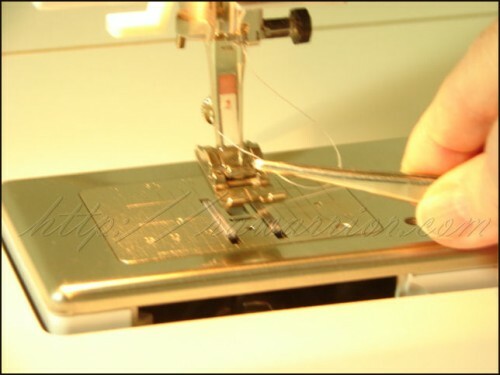 So the pictures show how I use a long pair of tweezers to thread the needle. I use long tweezers which can be bought at hobby or sewing stores. The tweezers hold the thread: it doesn’t take as much hand strength to pinch my long tweezers as my small ones, and it holds the thread in place so I can get it through the eye of the needle. I found a small travel iron to use. Most irons too heavy for RA people to manage very well. Cutting fabric seemed impossible. I had two different rotary cutters. 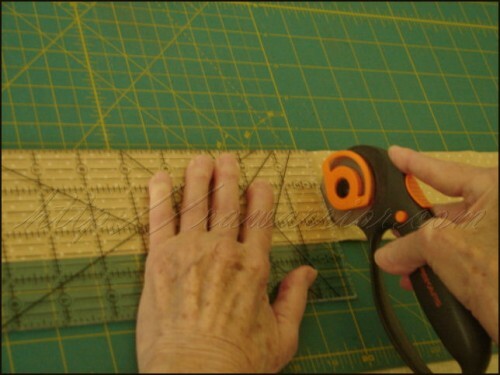 Then, I experimented with using a curved plastic ruler and the rotary cutter. 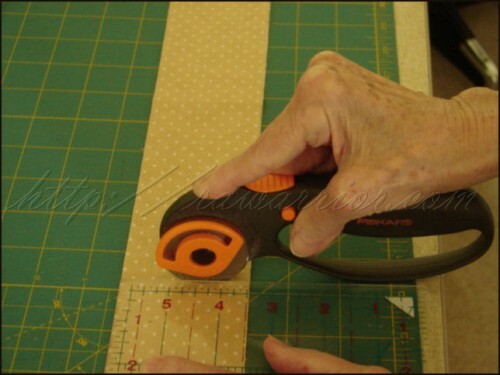 When I tried using each one, I found I could get enough leverage with my Fiskars brand one. As long as I keep sharp (fresh) blades in the rotary cutter, I am able to cut out what I want using a plastic ruler along with the rotary cutter. Since lack of strength is again an issue, the sharp blades make all the difference in success and failure. When I need help, my husband is willing to do cutting for me. I couldn’t manage without him. He is my special blessing. Stiff fingers have an awful time keeping layers of fabric evenly together and moving under the needle straight. I have started using a bamboo skewer to do both these tasks. The bamboo stick holds the fabric in place as it runs through the machine. The skewers are available in the grocery store. I seldom pin. You know how hard pins are to pick up & maneuver! 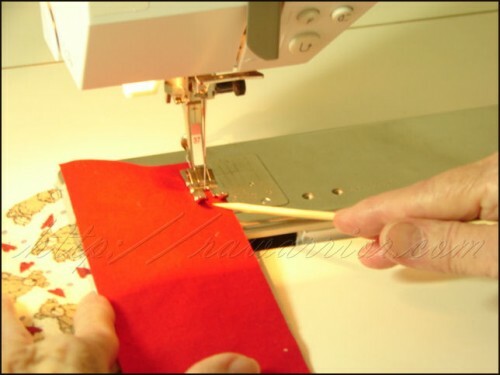 Using the skewer, I can control the fabric better & keep the layers together without pins. I hope we all will look at tasks in a different way and see if we can help one another continue doing the things we love. Don’t give up. It might take a little longer. It might not be easy. The results might not be quite as good as you used to be able to achieve, but the goal isn’t perfection. The goal is to keep living a good life no matter what our physical condition. As a fellow seamstress/artisan, I can tell you I too have had to find ways to make my hands work on the days they refuse to wake up. In the last 5 months my wrist and hands have been dramatically affected by RA. It’s been my worst fear and sure enough, it is coming to light. I can cry over this or I can buck up and try to find gadgets that work for me so I may do the work I so dearly love. I find many times adaptation is the number one neccesity we all must get used to. No longer can I just do things as I once did and in that, a little bit of geez oh why me might strike. But, I have faith in the Lord above that I will overcome whatever is put at my feet with due diligence and prayer. Hi Tammy, that was one of my worst fears a while back. I remember knitting as much as I could in small bites a couple of years ago thinking it could get worse & end my knitting / hand sewing. That did happen & I was so happy I had made those things for my kids. I hope to do more, inspired even more by Carolyn. This year, I’ve worked hard on those Boy Scout uniforms – still not finished – but slowly making progress. And it does make me feel good. Sometimes doing whatever it takes means medical treatment or taking a break from the work too. So don’t be too hard on yourself. Amazing! Thanks for sharing that. It is encouraging in that I have had to do this in my passions to keep doing them and it is great to hear how other are adapting as well. I love to crochet but since my diagnosis about 10 years ago I have had to give up on some projects. I can no longer do Fillet crochet. That is the type that makes dollies and covered Christmas ornaments and home decorative items. I still do crochet. I have to plan on it taking longer to do. I now crochet before I know who the gift is for. Working on baby afghan now that I started a year ago. I know that there are sometimes when I should not crochet. Usually it is during a flare that effects the hands,wrist. However I remind myself that it should be short term. I try to crochet for at least 5 minutes. The more I Crochet, the less i eat. Keeps my hands busy. I have learned that when I am feeling good, I need to be careful not to do to much. I have also looked for tools which are adapted for injured hands. I found a crochet hooks kit from provo craft that is ergonomic. It has two large handles which i can screw smaller handled hook heads into. As a result of this project I have been able to crochet much more frequently with less overuse pain. Even when my hands mildly hurt, I can now still crochet. And I bet we could wrap the needles sometimes to make them bigger like we do w/ toothbrushes. I may try that for knitting whenever I get thru the Boy Scout patches. I know, Rositta. I haven’t picked up a shovel to landscape or even a rose pruner in a few years now. But maybe someday I might get to garden, especially if I can get more help & a medicine works for me. I hope there are ways you can do something else to make up for it. I am a freshly diagnosed “warrior”. Over the 8 months it took for a diagnosis, I had pretty much given up on the whole crochet/knit thing – then I discovered prednisone! Once I started feeling a little better I also purchased crochet needles that have the rubber hump in them and find that now I am able to crochet for short periods of time. I have just started on methotrexate and my Rheumy is allowing me to continue with the pred for the next month to see how it goes, so I will be taking advantage! I have lots of friends that are having babies 🙂 On another note – thank you so much for all the work you do on this website, it was a lifesaver for me while I was going through the endless doctor appointments and lab tests prior to finally finding out what was wrong. I’ve learned alot – you rock! Glad you found us, Kim. It also rocks to meet warriors like u! :rainbow: Good luck w/ your treatments. Lots of methotrexate info on the menu. This post is a perfect segue into my latest Blog post. I sent you a note on Facebook, but I wanted to make sure you and your readers here see it too. You inspired me to come out proclaim my RA to my friends, colleagues and coworkers. I hope you don’t mind, but I name you in my blog post, and — though we’ve only met virtually, I list you as a friend because you’ve done so much for me and the rest our community. I have NOT given up on the things I love to do (or at least, I haven’t lost most of them — as you’ll see in my post). But I have changed the way I do things. Anyway, my blog link is pasted below. I’d love to hear your thoughts. Dan, your blog is wonderful. Thanks for being so kind to me in it, too. I’m honored to be your friend also and to know we can fight this battle as compatriots. To all of you brave warriors, hooray to you for finding compensatory ways to continue your loved activities. I, too, had to substitute new passions for the old ones. Music was my passion and my bread-and0-butter. I can’t do that anymore, but I CAN take photographs, and write books and blogs, about which I am passionate. I can’t sew, but my kids are now grown, and I discovered thrift shops–so I don’t really need to sew. I even at one time sewed on a commercial machine to help make canvas luggage for my daughter’s business (not a good idea for my wrists)!After 54 years with RA, there are finally a few “cants”, a word I never allowed myself to use, but there are still a lot of “cans.” You name a problem and I’ll bet I have a way to do it, even if your hands are “gnarled” like mine and fingers subluxed!! Just ask. 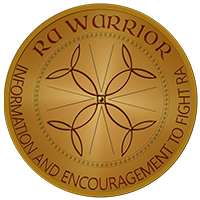 I realize that this initial posting is a few days old and that my post may not get much traction, but I heard a story yesterday that moved me and also fits along with these posts in the perseverance of something that you love in the face of RA. No, this post is only a few days old! We get comments on all the year-old posts through Google searches all the time, so please feel free to read & comment on ANY post here! I think that bmj link is one of the ones I used in a post on Renoir a couple months ago. Wasn’t he an inspiration? How dense of me to not put a link to his story here on this blog. Thanks for your contribution! Good job Carolyn! This is what it’s all about, still finding a way to do the things that you love. Most things in life, we can’t do exactly like we did when we were healthy, but it’s about not giving up, adapting and still enjoying life. Kelly, thanks for this post. I think this speaks volumes to other RAer’s that we can continue to enjoy life, maybe a little slower, maybe a little bit altered, but we can’t sit down and give up. What an inspiration this post/comments section has been! It really is important for our physical and emotional well being to make modifications so that we can continue at least some of the things that we enjoy. I haven’t been able to take care of a garden in a long time, so I started growing lettuce, herbs, etc. in pots. I used to make large quilts with lots and lots of pieces sewn together by hand. Now I make cheat quilts (a large piece of fabric in the middle with stitching around the designs, items, etc. to make them “pop”) surrounded by other large strips or blocks of fabric to make baby to nap sized quilts. It does take a long time as I can only sew for a few minutes at a time and then have to rest my hands, but it does get done. My quilting buddies have been very supportive and have assured me that I am not cheating with these modifications. I am no longer doing the shopping for the church kitchen, but I soon will spend an hour every now and then making telephone calls for the minister. The point is to modify, modify, modify, and if you have to totally give up something, if you can, try to fill that void with something that is meaningful to you, that you can do, that is not stressful for you, and is something that the world won’t fall apart if you can’t get it done like yesterday. I must say I was remarkably well prepared for old age, since I had dealt with RA crippling for decades before the somewhat-similar old age effects began to kick in. We all get old and stiff in the joints eventually if we live long enough, so RA is good training. For years, I’ve said I’m the queen of compensation (and adaptation), so there IS something good about RA, after all. do you know what they are called Joan? 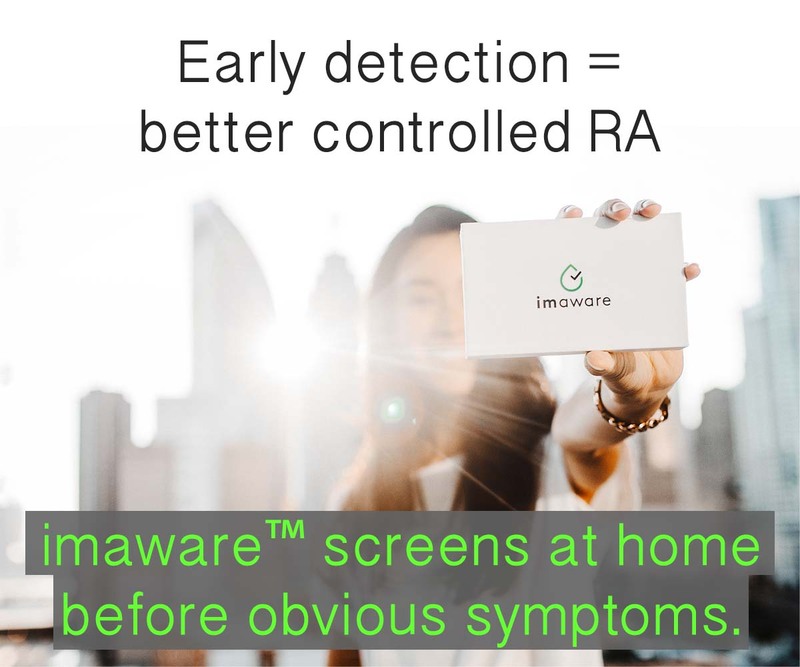 I’m suspecting I may have RA and will be getting a diagnosis soon. I, too, am a stitcher and am worried about losing that in the future. My grandmother gave me a tool that really helps when hand sewing because she had trouble threading needles. Here is the website for it http://www.techforltc.org/product.aspx?id=3867. Thank you for this blog! I purchased your suggestions for cutting fabric. I tried your ideas for threading a classic-830 Bernina sewing machine. I discovered removing the foot before threading allows more space for fingers and more light to see. Winding the bobbin and inserting in that confined base are problems for me. I found bobbin winders ranging from $20 to $80. Do you have any experience with bobbin threaders? Would needle-nose pliers help reinsert bobbin holder in the base? I have acute RA and Fibromyalgia, and I immensely enjoy sewing, especially small quilts to hang on walls or to place on tables, etc. Try to keep my hands as limber and strong as possible by crocheting, cross-stitch, embroidery, and of course sewing at my machine. I try to plan out my machine sewing, laying pieces in order, so that it’s easier to just run them through the machine. Using a brass stiletto, like your bamboo skewer really helps, and I pin things together ALOT! Your article is helpful and encouraging. Sewing is a BIG part of my life, and without it, I’m not sure what I’d do. You have encouraged me on a day when my hands ache so much I have cried. Thank you! Keep sewing! It is the very crucial time when your mind is very disturbed due to RA and you wanna love everything but can’t. The morning meditation helps a lot in this situation. Meditation teaches us to love with yourself first and then love with all.